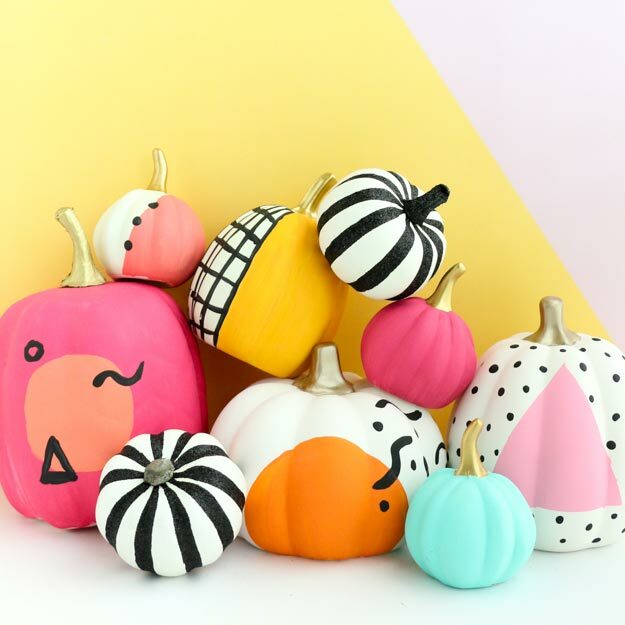 If you need to get inspired this season with the best Instagram worthy painted pumpkin ideas, then we have done all the work for you! We scoured Instagram and found cool pumpkin ideas to get you in that fall fun mood! Most of these anyone can do, but a few of them cross over into the “artist” zone. That’s ok, they can inspire you to come up with your own amazing pumpkin painting ideas! Where tutorials exist, we have tried to track them down and get you a link. Either way, these Instagrammers are definitely people worth following! 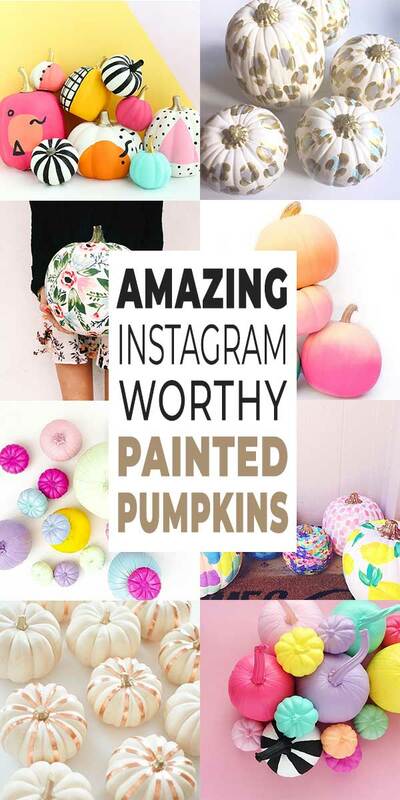 Check out these painted pumpkins, Instagram style! This first pumpkin painting idea is awesome. I think I could definitely take on several of these no carve pumpkin ideas with a foam paint brush and some craft paint. You could too! Remember to let each paint color dry between layers. Easy DIY pumpkin idea! Try using chalk paint for the body of the pumpkin, and then use permanent markers or oil based paint pens for the accents. These floral painted pumpkins on Instagram are works of art! Don’t have that much painting talent? Then use these painted pumpkin ideas, and make some easy hacks to the project. Use floral patterned tissue paper instead, and decoupage it onto the pumpkin with Mod Podge! Want something different? Try these Asian style painted pumpkins. Love them! I will admit, they may be a little past my artistic abilities to re-create… But then again, why not try! Let’s look at these amazing colorful painted pumpkins for us to drool over. Personally, I love the unique, fresh and unusual pumpkin ideas! Bring on the color! Take white pumpkin decorating ideas to a new level by adding a graphic black painted pumpkin design. You could either use paint and a small artist brush, or a paint pen to create these painted pumpkins. Spiced up pumpkins ? #nocarvepumpkins #handdrawn #decoratedpumpkins ?#handlettering ? #whimsicalflowers #eleiinkandpaper ? #personalizedpumpkins #handpaintedpumpkins ? Leopard spotted pumpkins, anyone? These were done on craft pumpkins, (you can buy them from the link in her profile!) or you can get inspired and paint your own! Ok, this paint pumpkin looks like it took some time. The mermaids theme is trendy, and the colors are eye catching! Marbled painted pumpkins are an easy DIY idea! You can find tutorials by searching the web! So easy, right? This pumpkin idea has nothing to do with paint, but the copper tape idea was so genius, we had to include it! Keep in mind, you could use paint to create the same look! Rose gold, anyone? Seeing lots and lots of bright colored pumpkin painting ideas this year! And the black and white pumpkin just sets off all the others! Easy! We hope you loved our little painted pumpkin trip through Instagram! Amazing photos of easy DIY pumpkin decorating ideas! We think you will also love our post on Pretty Painted Pumpkins, No Carve Pumpkin Ideas and 18 Classy Fall Decorating Ideas! Next Post Beauty Basics : Cleaning Makeup Brushes & Tools The Easy Way!